As our readers know, there are many reasons why we are opposed to the projects that are billed as native plant “restorations” but, in fact, often do a great deal of damage to the environment. Of the many bogus justifications for these harmful projects, one of the most patently false is that the projects benefit wildlife. Today, we are publishing a letter from one of our readers about the many ways in which nativism is harmful to bees. The chemicals they use. Of course, it’s been broadly publicized that glyphosate and neonicotinoids are harmful to bees, and the AG industry folks (and possibly the native plant folks?) counter that they are far less deadly to honey bees than other types of herbicides and pesticides…but the beekeeper I spoke with indicated that saying something is “less deadly” to bees misses the harm these chemicals do to colonies by weakening their ability to fight viruses, mites, etc. Bees foraging in chemical-laden fields bring residues of these compounds back to the hive, to the queen, which he likened to “placing a pregnant woman in a refinery.” The result is a dramatically shortened lifespan for the queen and a colony that’s less strong and healthy, with lower resistance to common diseases. So the chemical may not kill the bees outright, but it still contributes to their death in the end. 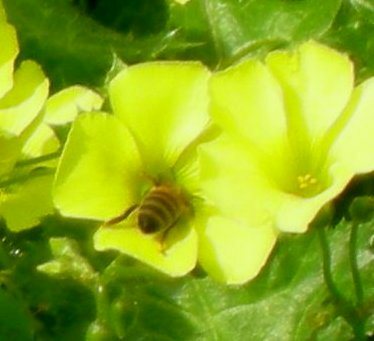 Honeybee on oxalis flower, another non-native plant being eradicated with herbicide. Honey bees are not native to America; they’re European. And the push to eradicate non-native “weeds” has decimated their forage…essentially starving them out. He cited the case of yellow star thistle, which, he said, may have come over from Europe in the wool of sheep. Highly invasive, it used to be everywhere in CA, and it was an important source of nectar and pollen for honeybees. Then, a few decades ago, the government introduced weevils to control the plant, in the process depriving the bees of a vital food source. Beekeepers have had to range further and further afield to find areas with adequate forage for their bees. 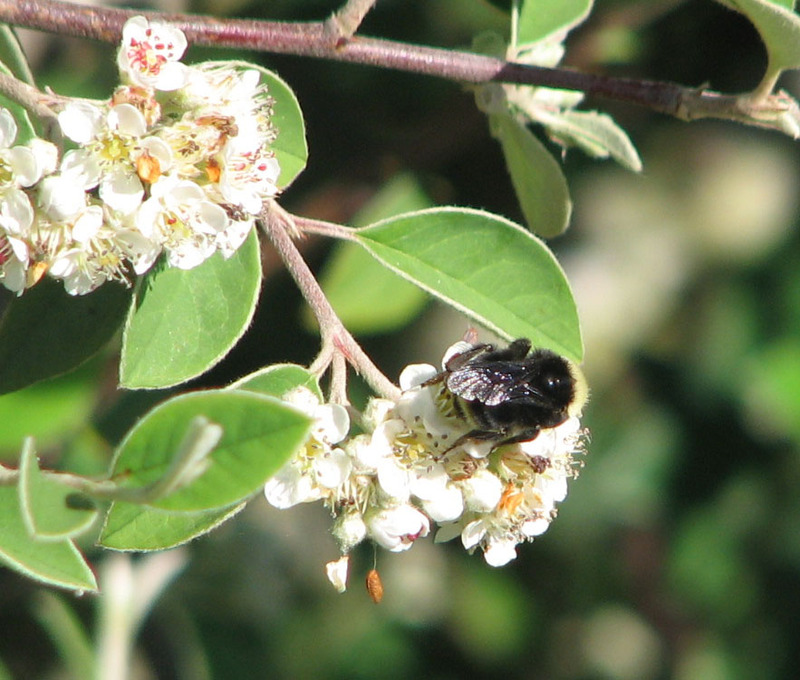 Bumblebee on Cotoneaster, Albany Bulb. Another target for eradication. The value of yellow star-thistle to bees is but one example of the value of non-native plants to insects and other animals. In the case of bees, the eradication of hundreds of thousands of eucalyptus trees all over California has deprived bees and hummingbirds of one of the few sources of winter nectar in California. Eucalyptus blooms from December to May, at a time when there are few other sources of nectar. HERE is an article about the loss of this important resource to bee keepers in California. 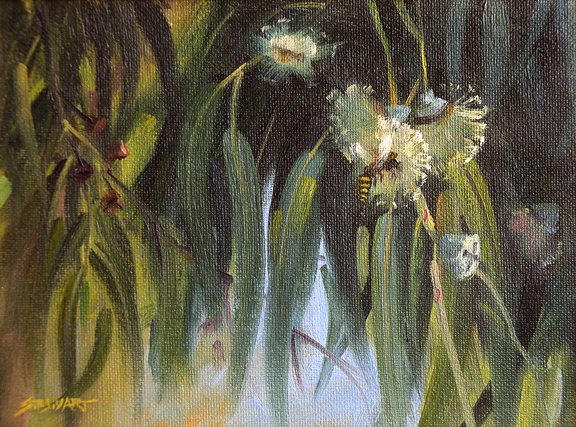 Eucalyptus and bee. Painting by Brian Stewart. Briones Park is adjacent to the watershed surrounding Briones Reservoir, which stores the drinking water of surrounding communities. The herbicide EBRPD was planning to use was Milestone, which is known to be very mobile and persistent in the soil. For that reason, the State of New York refused to approve the sale of Milestone because they were concerned about contamination of ground water. Aerial spraying of pesticides by helicopter is the most dangerous application method because it greatly increases the chances of drift into non-target areas, including residential areas. Our team of collaborators jumped into action to prevent this spraying from being done. We organized a telephone and email campaign directed to responsible staff and Board members at both East Bay Regional Park District and East Bay Municipal Water District, which is responsible for drinking water in the East Bay. I am pleased to report that EBRPD announced within a few days of our campaign that they were permanently cancelling this aerial application of herbicides at Briones Park. They will continue to try to eradicate yellow star thistle using other methods. When pesticides are used in native plant “restorations,” the claim that such projects are beneficial seem utterly dishonest. Beneficial to whom? Certainly not the animals and humans who are exposed to these toxic chemicals. It is a team effort to learn about what is happening in our public lands and to participate in the decisions that affect our communities. We are therefore grateful to the reader who shared her conversation with a beekeeper. We encourage others to share their knowledge so that we can be as effective as possible. Knowledge is power! Honeybees show the hypocrisy of the nativists more than almost anything else. All non-native animals should be killed or eliminated (except for them)? But what about honeybees who are native to Europe? Of course nativists want them because of how important they are in pollinating the non-native plants that the nativists love to eat. I’ve been noticing in the Bay Area bird groups on facebook that so many of the spectacular photos of nesting and roosting birds show them in Eucalyptus. It’s not just raptors and hummmingbirds who need them. They are ideal with their height, open canopy, and sweet flowers. I am sorry to say that not all nativists are willing to give honeybees a free pass. The Nature Conservancy is eradicating honeybees on their properties on the Channel Island, one of the most extreme “restorations” ever attempted. More recently, I read a story in the High Country News about honeybees being evicted from federal properties based on the claim that they are spreading disease to native bees. The study cited for that claim looked suspicious to me. When honeybees are evicted from open spaces their nectar sources are reduced and their ability to survive is threatened, as the letter from our reader says.